My husband and I both camped when we were younger and want to enjoy these trips with our family as well. Yet, it went so poorly with babies that we set those plans aside a few years until our daughters were at a better age for travel. Last year we hit South Dakota and it went amazingly well–we wanted another week of camping this summer. So we headed to Minnesota’s North Shore, which offers miles of gorgeous Lake Superior views. Hiking, shopping, tenting–all good. 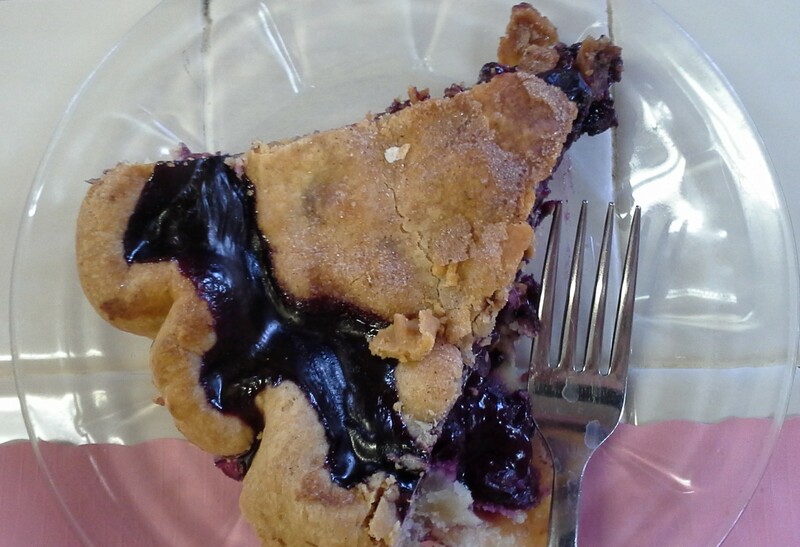 But my favorite part of camping–and travel in general–will always be the food. Memories of childhood camping include my mom planning menus and packing food in crates and coolers. Mom is far more organized than I, so my planning and packing efforts pale in comparison, but just the same I love to think through meal possibilities and pack accordingly. Many of my husband’s family’s friends gave us camping gear as wedding gifts, most likely with the hope of taming the “city” in his “city girl” bride. 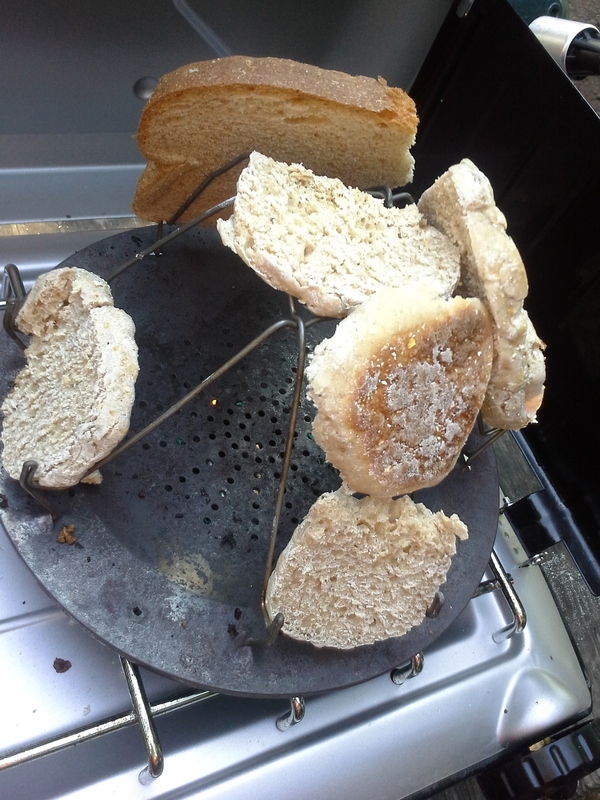 One such gift was a camp-stove toaster, which toasted sourdough English muffins for egg sandwiches. We’d also brought an Italian-spiced bacon from a favorite meat market and I’m already planning a return trip for more. 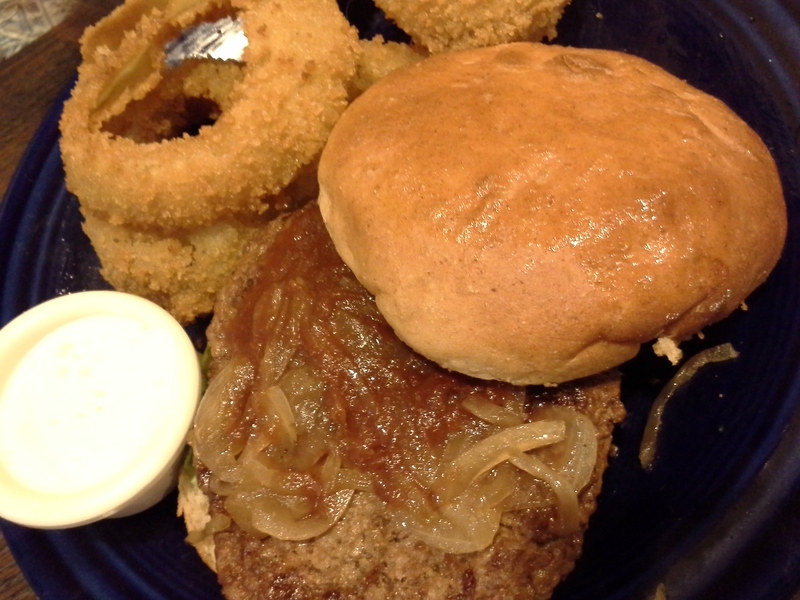 Typical drive-in food at A & Dubs. 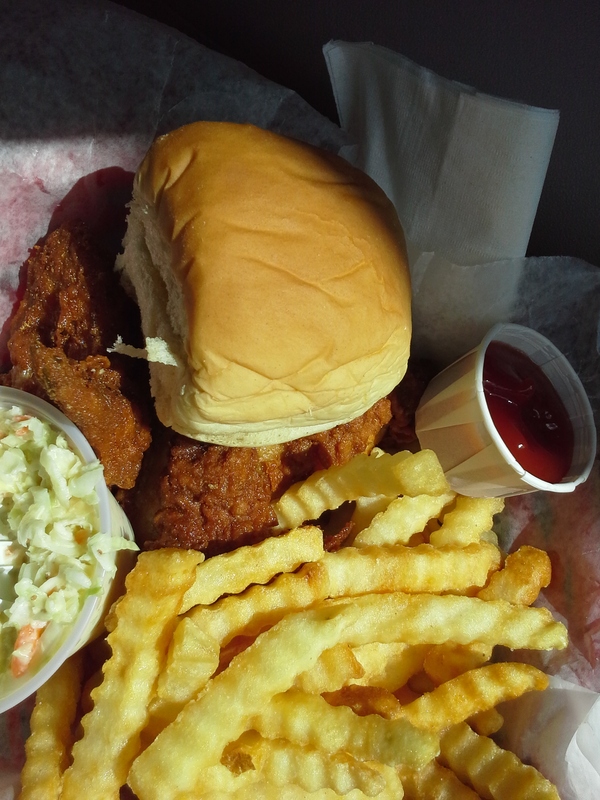 Chicken basket, fries, cole slaw. The butterscotch malt? Already gone! The Duluth Grill makes a great case for going your own way. Originally partners in the Ember’s chain, the owners tell of the day they ran out of pancake mix. Choosing to make their own ‘cakes from scratch–which tasted better and cost less–was a light-bulb moment. 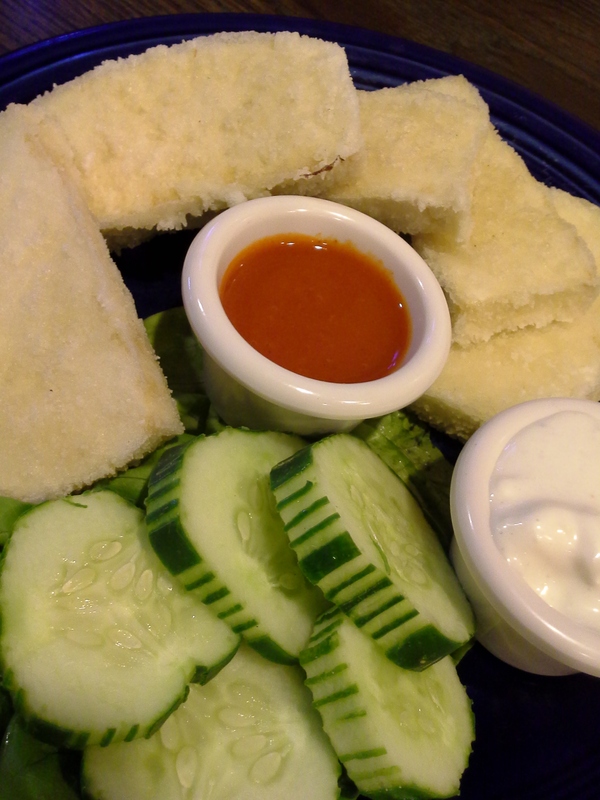 Their partnership with Ember’s eventually flamed out and they now have vegetable and herb gardens (the server’s shirts read “Veggies fresh from the parking lot.”) and serve imaginative fare–some out-there, some more down-home–all of it made onsite using local and organic ingredients. My one regret was not having room for the When Pigs Fly sundae: vanilla ice cream topped with cherrywood-smoked bacon, pecans, homemade caramel sauce, and Hawaiian red sea salt. 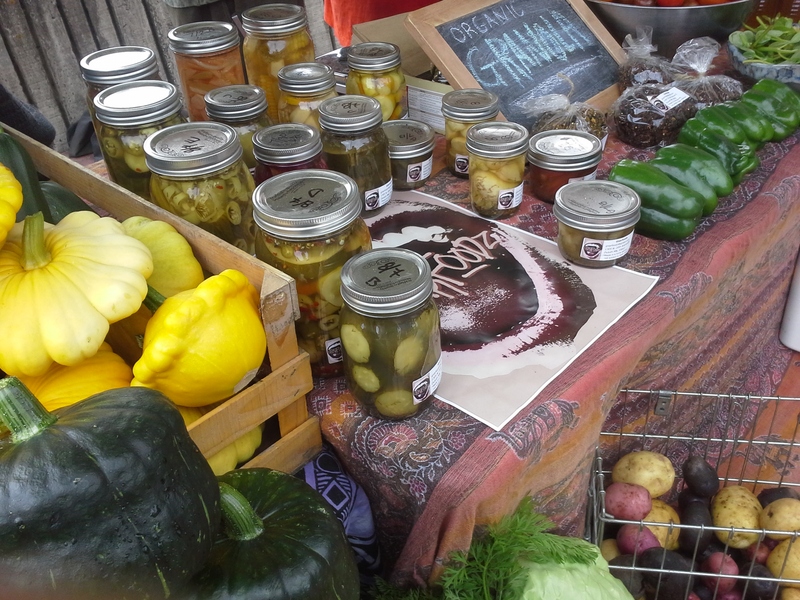 While not technically a lunch stop, I enjoyed wandering a downtown outpost of the Duluth Farmer’s Market. My favorite find: curry coconut granola. My oldest daughter likes to have her night as head chef to serve up Girl Scout Gumbo (no scouts were harmed in the making of this dish, haha). 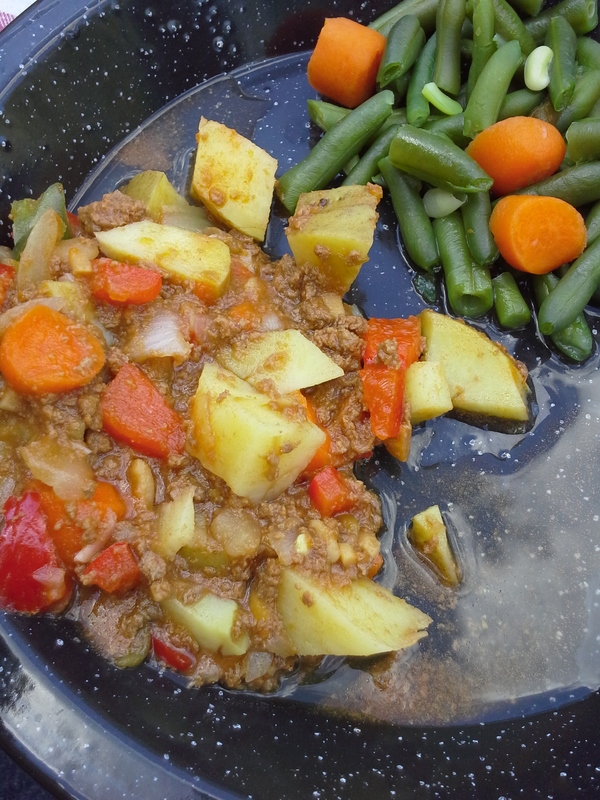 A hearty mixture of potato, ground beef, bell pepper, alphabet soup, and onion, it goes over especially well when camping. 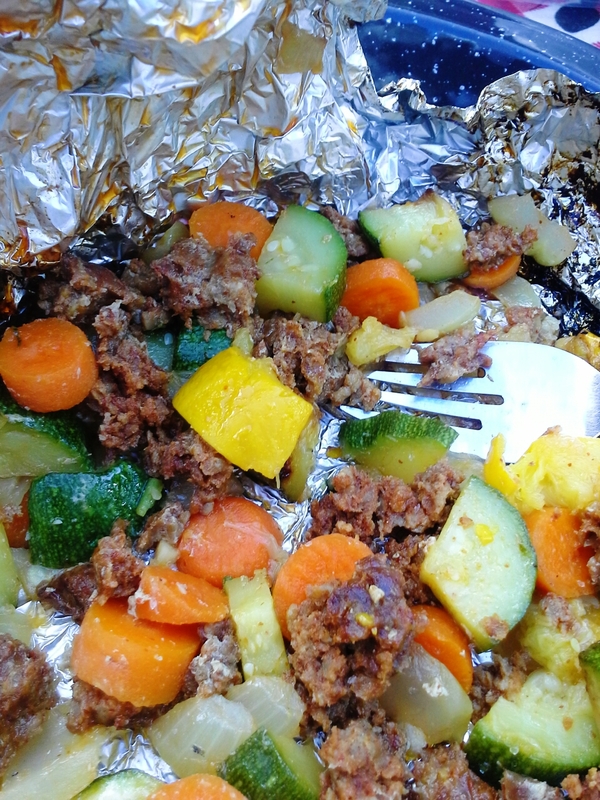 Hobo dinners are another childhood camping memory, so these fire pit-roasted beef-and-veggie packets were on our list. We changed it up by using chorizo instead of beef and I’ll never go back. 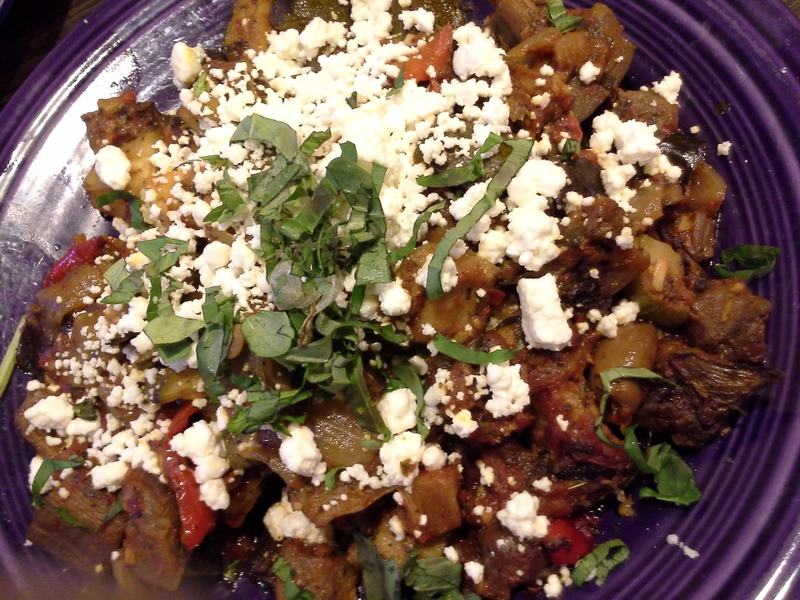 The chorizo’s spices (and fat) gave the veggies immeasurable flavor and tenderness. I’d read earlier about cooking breadsticks over a campfire, so had made up a ziploc of dry mix at home and added the liquids at the campsite. 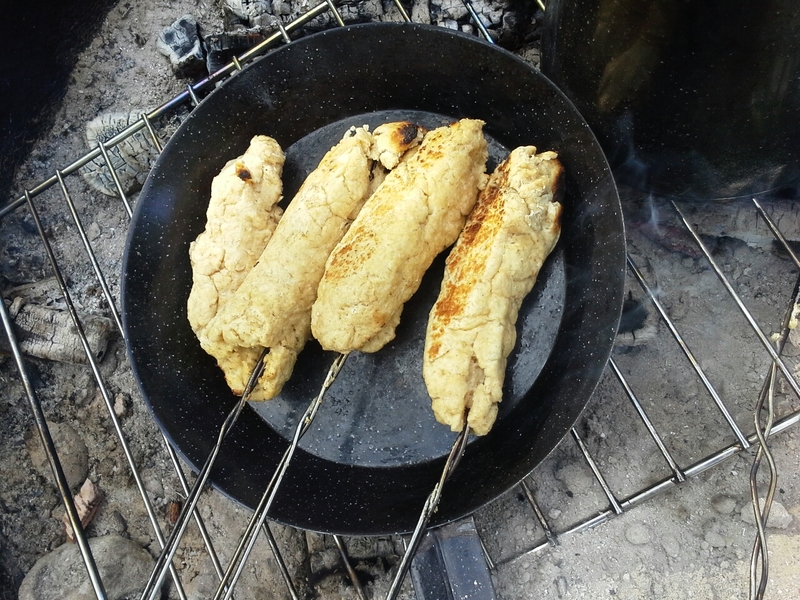 They were tricky to cook on a stick, as they tended to droop with the heat and fall into the fire. And cooking too close to the flames left them charred. What finally worked? Laying them in a skillet and turning them often. 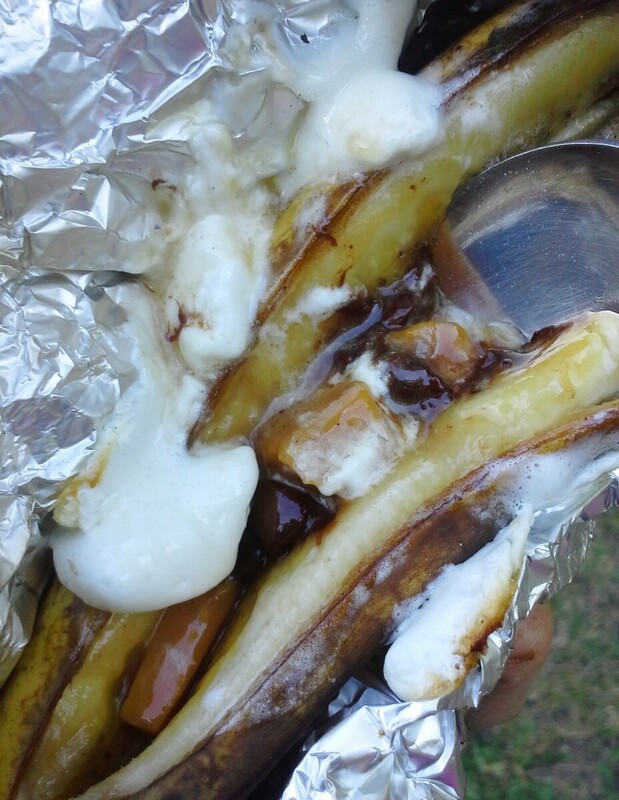 Banana boats and s’mores. 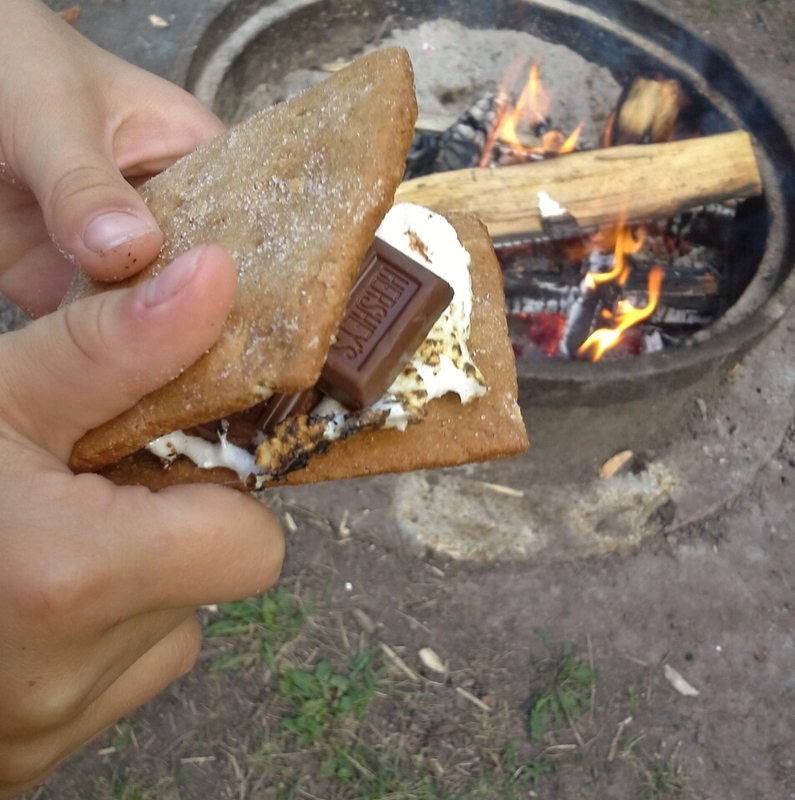 Typical campfire treats, but the s’mores were extra special this year as I’d made graham crackers à la Smitten Kitchen before leaving home. 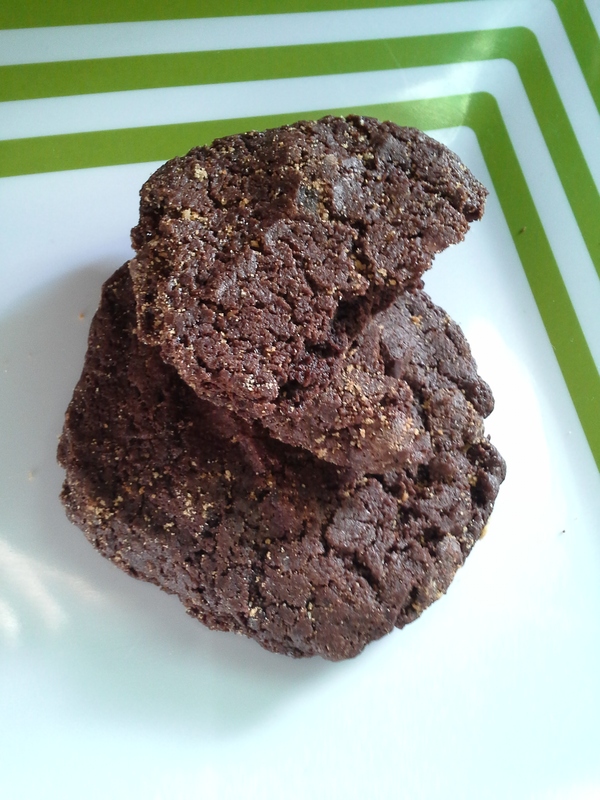 Positively Third Street Bakery: This tiny gem’s cookies sold out quickly. We never made it before noon in our two visits (to go back twice in five days says something about how badly we needed these cookies), so only had a few to choose from. Handwritten labels listed basic ingredients such as butter and sugar, but each variety had an extra “something.” Adventure, perhaps. Or Joy, Love, Good Times. Our favorite is the Skidmark: deep chocolate, hit of espresso, chocolate chips, etc. And the “special ingredient”? Burnt rubber–what else? 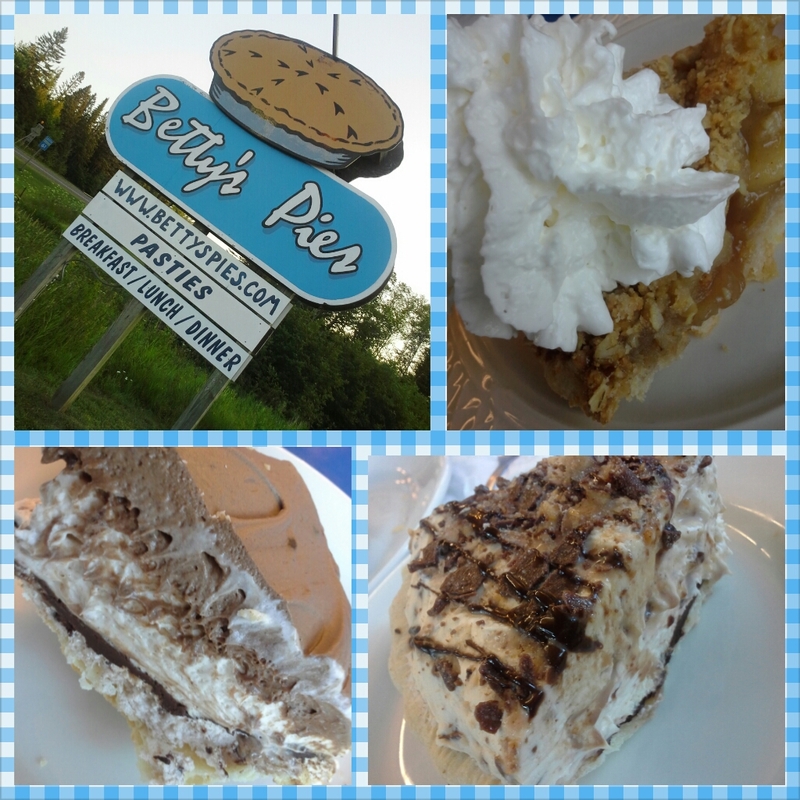 Betty’s Pies is state-famous (though the website claims world fame) for its North Shore location and crazy good pies. Just as fun is the kitschy blue-and-white checker decor. Another bit of culinary fun my oldest brought to the trip was ice-cream-in-a-bag. In a 1-quart ziploc, she combined 1/2 cup milk (didn’t seem to matter if it was full-fat, skim, chocolate, nonfat half-and-half–everything worked), 2-4 tablespoons sugar, 1 teaspoon vanilla, and pinch of salt. After sealing the bag, she put it in another ziploc and surrounded the sealed bag with rock salt and ice. 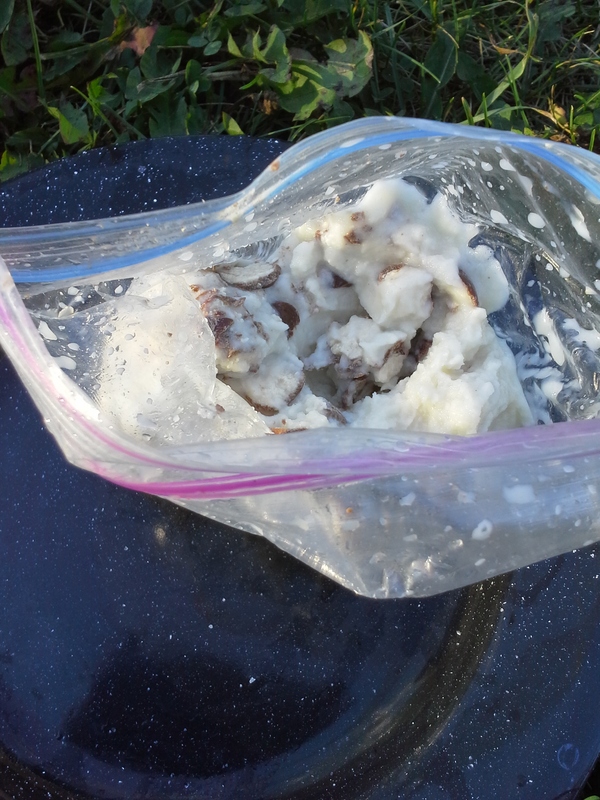 Five or so minutes of tossing the bag from one hand to another (wrapping it in a towel makes it easier to handle) turned out top-notch soft-serve ice cream. Because we’d picked up malted milk balls at a candy shop that day, we crushed a few and mixed them into the ice cream for a bit of texture and extra flavor. 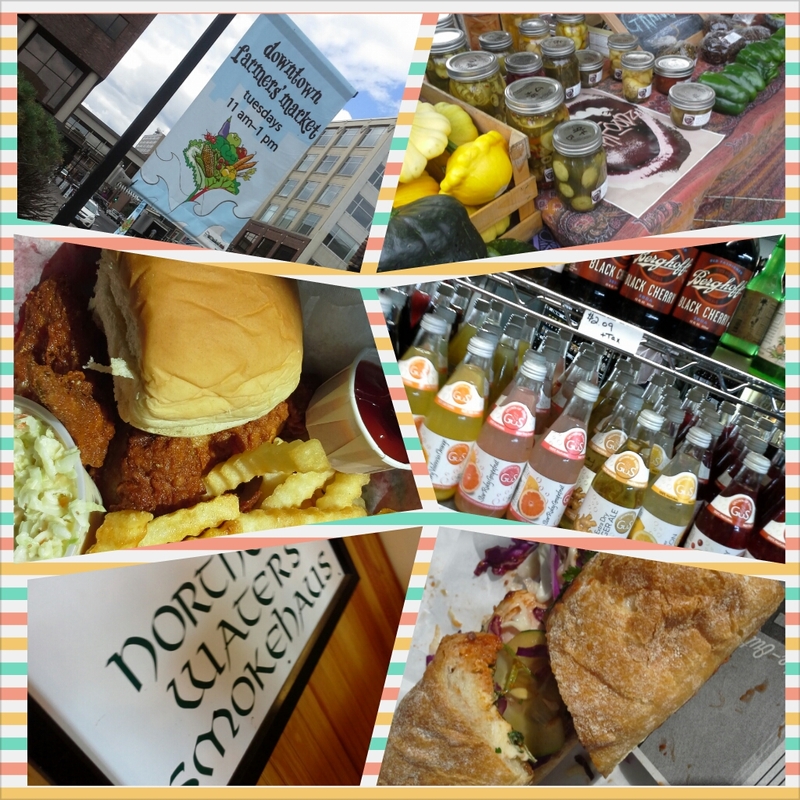 Northern Waters Smokehaus came highly recommended from multiple sources. A quick-order sandwich shop, they also smoke and sell their own meats and if I lived in Duluth it would be a regular stop. 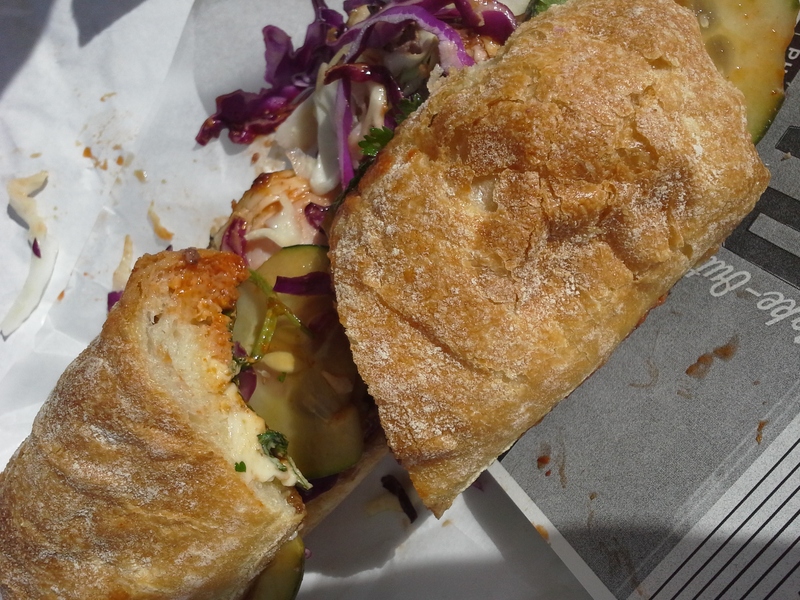 Their sandwiches are inventively named (my bahn faux mi layered Berkshire Ham, paté, carrot, cabbage, cilantro, quick pickles, hoisin, chili sauce, and butter–can you even imagine? ); I beg you to click on the above link for a taste of their creativity. Fizzy Waters focuses on sodas of all kinds–vintage and craft especially–as well as a smaller selection of old-fashioned candies. My daughters enjoyed a turn at the make-your-own-soda fountain and I’m giving my youngest the prize for most innovative with her version of Chocolate Sprite. Duluth Coffee Co. is said to be the antithesis of Starbucks and I can see why with its dark and spare space. As a non-chain fan (see above), I adored it. This coffee is served all around town for good reason. Roasted in-house, it’s fragrant, well-balanced, deep, and dark. I took home a bag–despite the steep price tag–as I need that coffee magic every morning in my own kitchen. We were glad to come home to warm beds and indoor toilets, but there is so much more food to be enjoyed that we’ll be back. 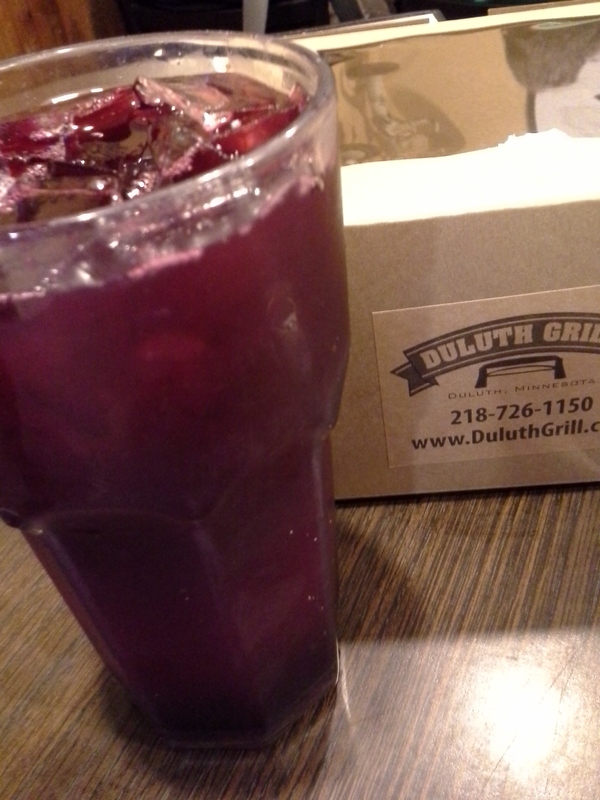 I anticipate a Duluth Dining II post (camping optional) sooner rather than later. Because last summer’s family camping trip went far better than expected, my husband and I committed to doing it again. We stayed closer to home this year, hitting Duluth for a few days, then traveling north to camp at one of the mind-blowingly gorgeous state parks on Minnesota’s North Shore. I’d taken a page (literally, I tore out a page) from our local paper’s Taste section featuring dining musts in Duluth, so with a car crammed with kids, camping gear, and plenty of food, we hit the highway. Great fun (and food) followed and I’d hoped to post a recap this week. But re-entry has been tough, so instead I’ll simply ask you to (please) hop over to the latest Funny Names in Food installment for the story of sweet treats. Though don’t think I’d leave you without at least a little bit more. I offer another story here, this one of crazily crafted cake pops. A recent batch of chocolate raspberry cookies impressed me greatly and I added the two dozen or so that were left to our stash of camping food. They were soft cookies, so I shouldn’t have been surprised when they crumbled into cookie dust during transport. (Ziploc bags only provide so much cushion.) I briefly considered throwing the lot, but remembered the spendy chocolate and fresh berries they contained. Surely there was a use for them. And there was: cake pops! A cup or so of leftover chocolate frosting waiting for me at home was just enough to moisten the cookie crumbs. 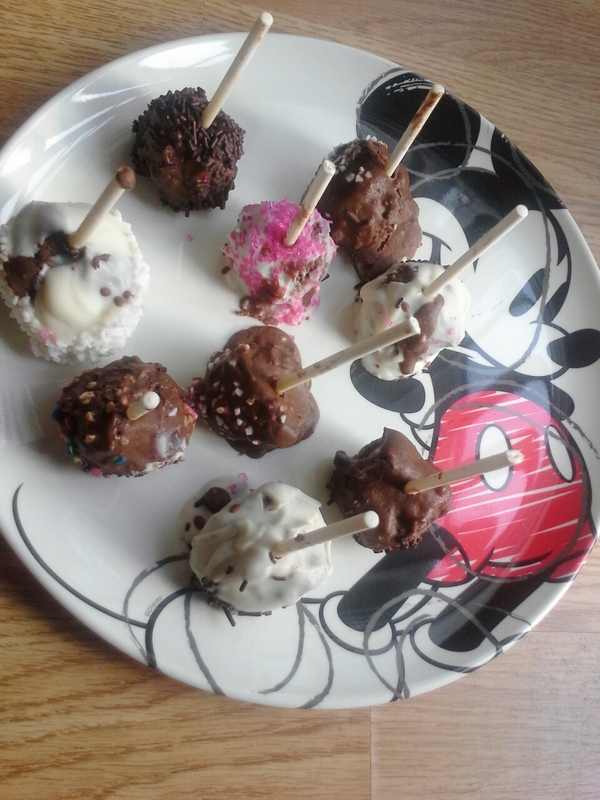 The mixture was then formed into balls, dipped in melted chocolate that had been thinned with coconut oil, and rolled in sprinkles and sugars. While not “pretty” à la Martha Stewart, they’re cute in their own rough and tumble way. And more importantly, they taste phenomenal. Combining cookie crumbs, homemade buttercream frosting, and melted chocolate could never be anything but knock-your-socks-off dreamy. Our family recently camped our way through South Dakota–Badlands, Black Hills, and the like. I wasn’t at all sure that it would go well as our week-plus trip would be the longest we’d camped with our girls. My husband and I enjoyed camping pre-kids, but our first forays into the camping wild with babies were disasters, so we’ve been cautious with our travel plans. With our youngest at age 6, we figured we’d give it another go. And I’m pleased to say that things went extremely well. No surprise that one of my favorite parts of camping is the food. I enjoy planning meals, packing the food, then making things happen at the campsite. For sure there are restaurant stops (lunches usually), but breakfasts and evening fare are made over the campfire or on a campstove. Our campfire cooking was curbed as soon as we crossed over into the western part of South Dakota as their extreme heat and dry weather meant Burn Ban. S’mores would have to wait for another trip. The first night’s meal proved our camping skillet to be in sorry shape. Next trip, we’d bring the cast-iron, but this go-round we found that anything we heated, even if over a low flame and for a short time, ended up overcooked (read: charred). Just the same, our camp meals were fantastic. After a long day of travel or a long sleep in the tent, whatever we cooked up on that stove was divine. 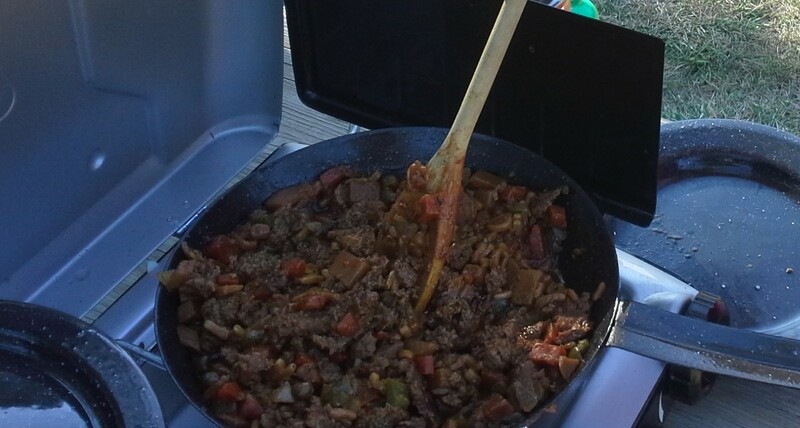 Pasta sauce, ground beef, and spaghetti noodles; Girl Scout Gumbo and rice (my oldest, who had recently been to Girl Scout camp, took charge here); steak and veggie stir-fry with barley; hobo dinner (sans campfire, the ground beef, potatoes, onions, carrots, and bell peppers cooked in a skillet instead of in the usual foil packet); burgers and fried potatoes. But the best meal I ate? Our pancakes and eggs. No photo of this meal as it wasn’t much to look at. But it absolutely hit the spot that morning. I’d just come back from a run and felt I’d earned a good meal. My husband had already cooked up pancakes for the girls and had (thoughtfully) left a tin cupful of batter for me so I could fry mine up fresh. 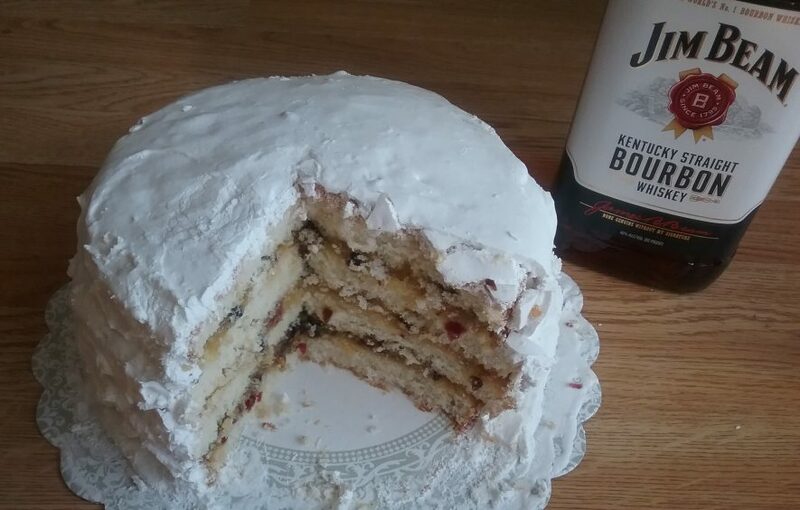 I cooked up a ‘cake or two, also adding our last egg to the skillet. The stove was on a slight slant and food ended up running together in the skillet. As well, the pancake batter cooked up unevenly in our piece-of-junk skillet. Once plated, my breakfast consisted of unevenly cooked and misshapen pancakes attached to an overcooked egg. Doesn’t sound appetizing. 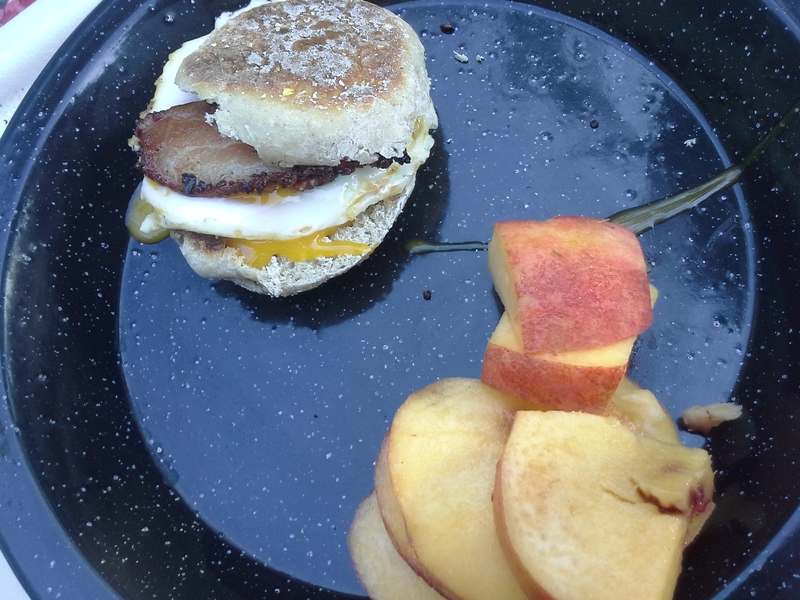 But eaten outside, topped with butter and rivers of pure maple syrup, and served alongside my wonderfully caffeinated hazelnut instant coffee, it was absolutely the best meal I had on the trip. 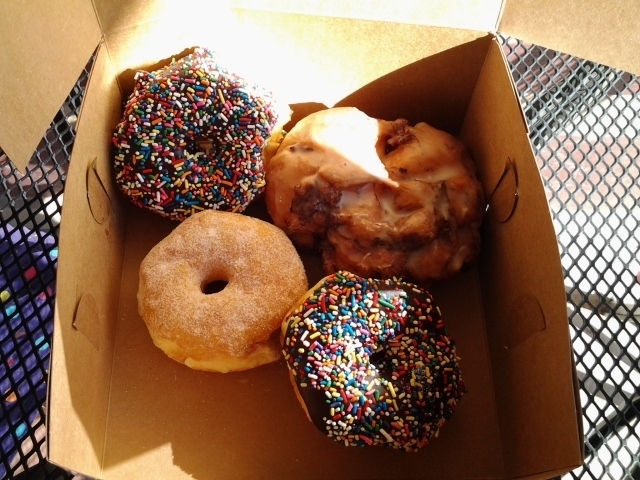 The best apple fritter I’ve ever tasted at Baker’s Bakery & Cafe in Custer City. 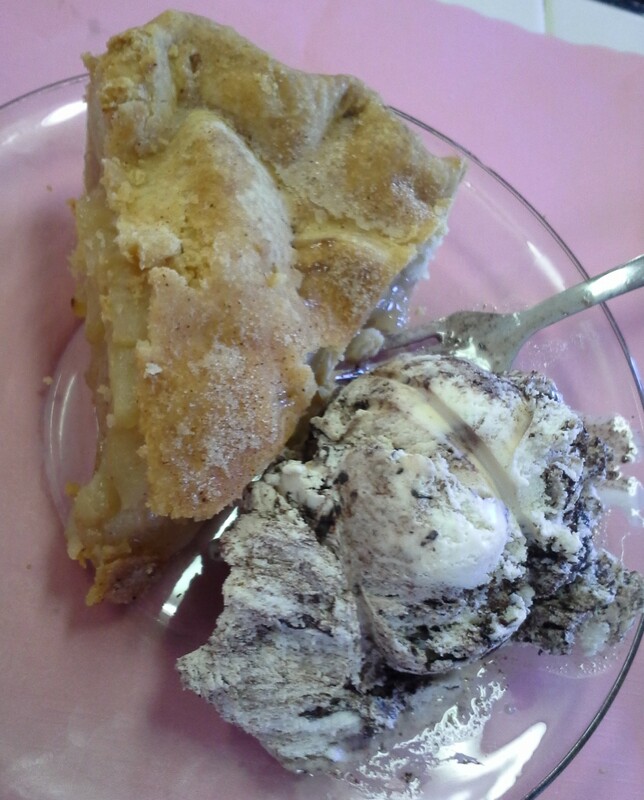 Huge slices of pie and an awesome birthday cake malt at Bobkat’s Purple Pie Palace, also in Custer City. 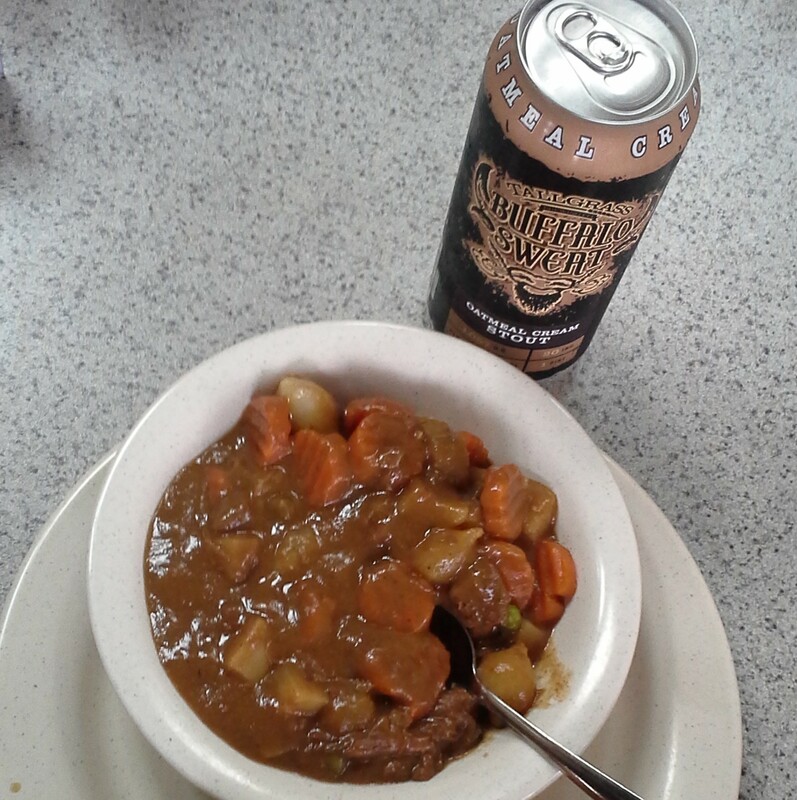 Bison stew (world-famous if the signage is to be believed) and Buffalo Sweat beer at the Mount Rushmore cafe. Fine dining it was not, but fun to find beer and bison at the foot of Mt. Rushmore. Downhome chuckwagon fare at the Circle B Ranch–roasted venison in a peppery garlic gravy, baked potato, cowboy salad, applesauce, biscuits, and ginger cake. 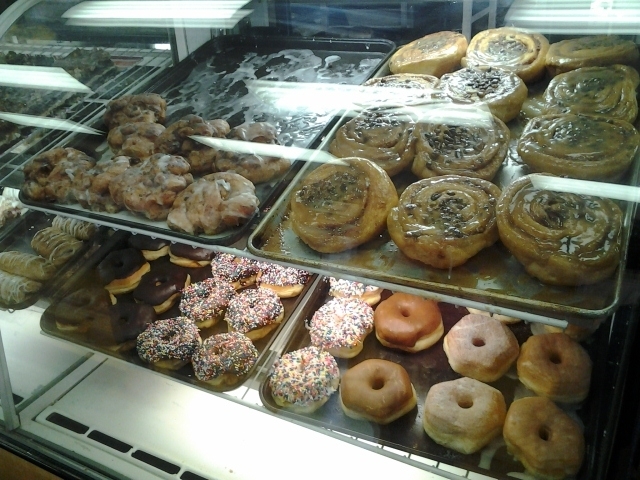 Donuts (again, said to be world-famous) at Wall Drug Cafe. 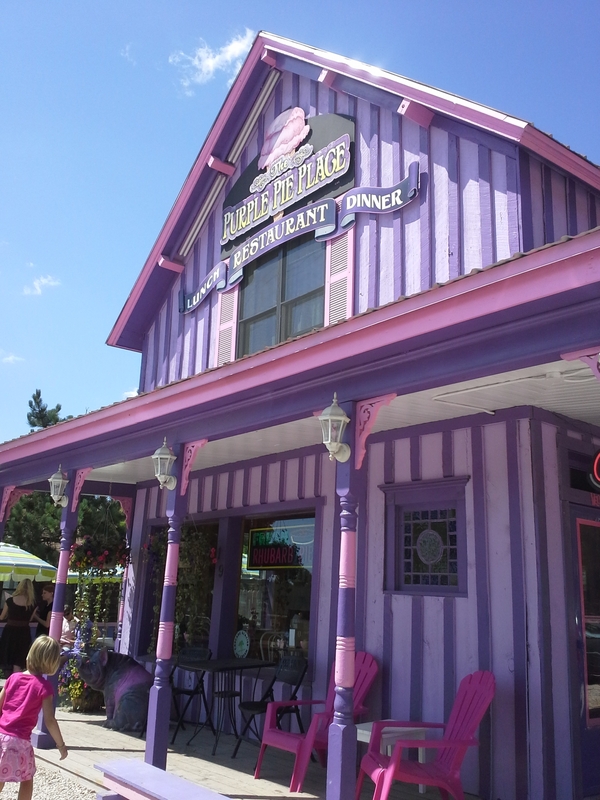 Wall Drug also had amazing ice cream, made in-house. 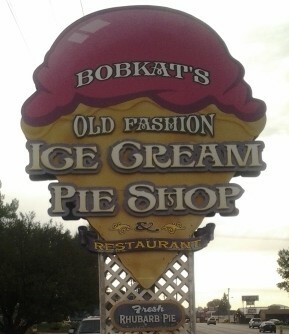 I have no pictures from this stop (my bad), but cakespy did a better job than I could have, so will send you there. 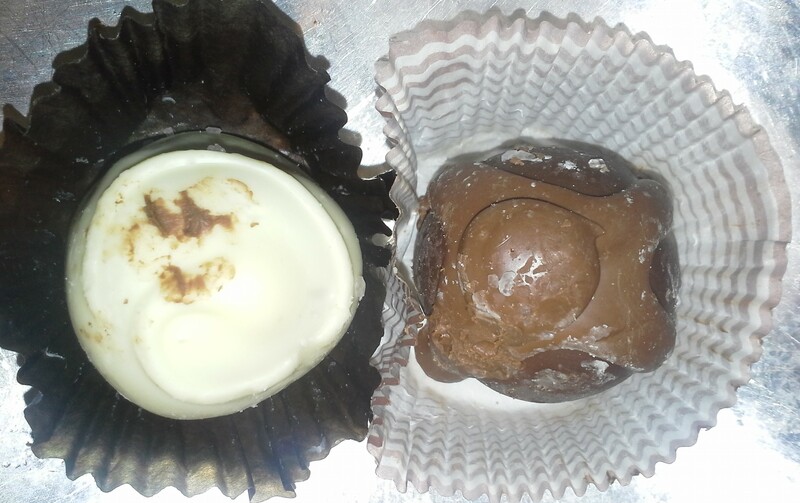 Assorted truffles at Silk Fudge in Keystone. I’m grateful to have taken a longer vacation with my family this summer. Its success means there will be more to look forward to, allowing us opportunity to cook the campfire meals we couldn’t on this trip. The s’mores await.